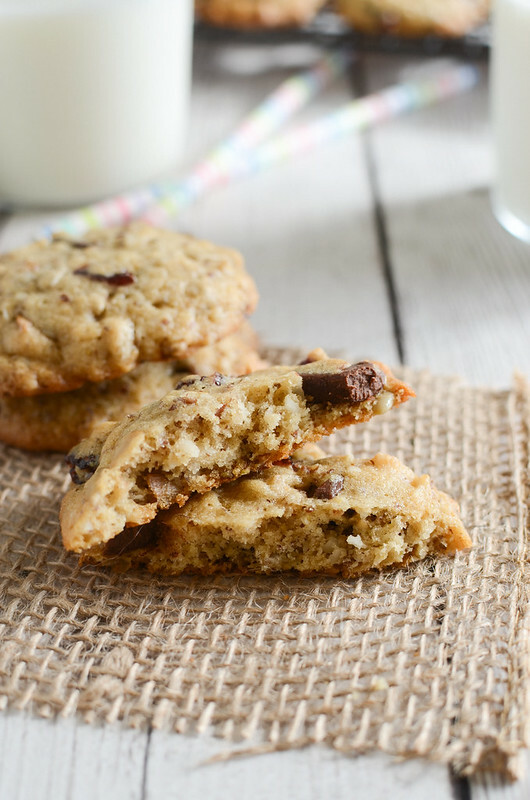 Healthy and delicious Granola Cookies! 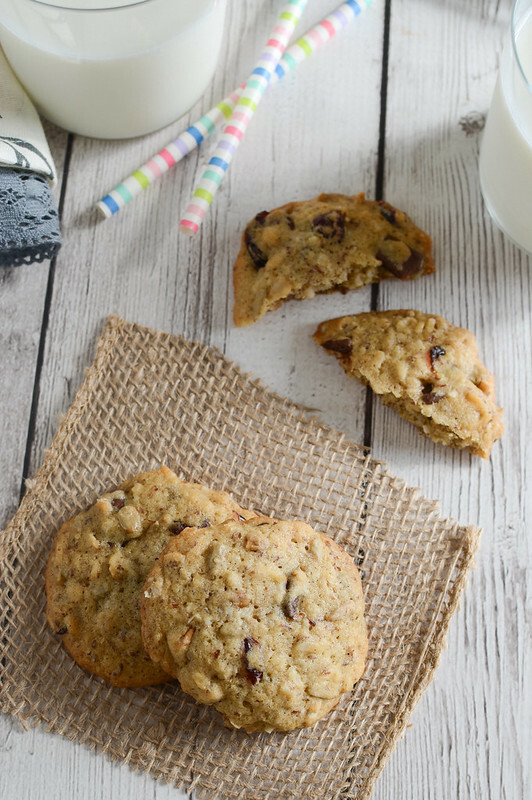 Filled with flax seeds, cranberries, sunflower seeds, oats, and chocolate chunks. 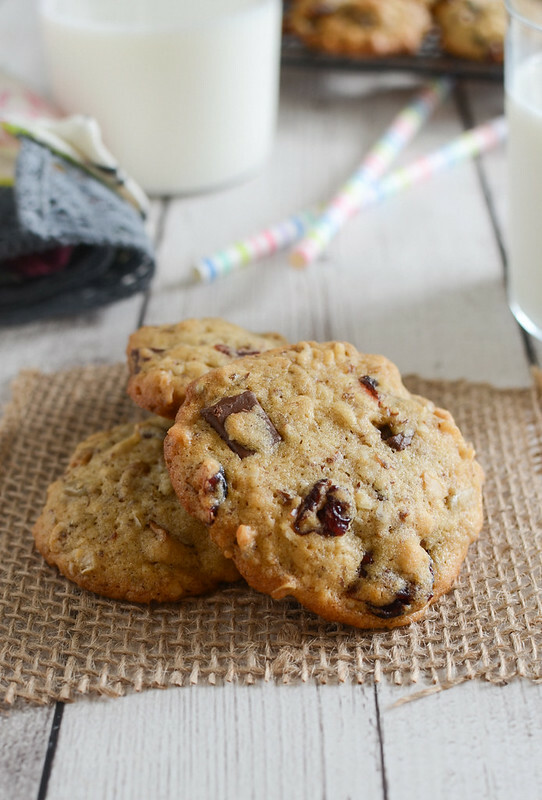 No guilt required with these cookies! I’m currently doing that annoying thing I do at least once a year. You know, where I decide I’m over buying boxes of cereal, crackers, cookies – fun packaged food that my kids go through like crazy, in other words. So I’ve decided that I am just going to make everything. Why do I do this to myself? WHY?! I swear it was only a few months ago that I did this same thing and by the end of the week I was at Target buying a cart full of goldfish, pizza rolls, and Cap’n Crunch. But we’ll go with it for now. I have also decided that the kids aren’t buying lunch anymore after the school allowed one of my kids to spend NINE DOLLARS on lunch one day. So they’ve been taking super boring (super healthy) lunches because I’m not buying granola bars and their other lunchbox faves and – surprise! – I don’t have time to make homemade crackers and fruit snacks. I finally got my life together enough this weekend to make these yummy Granola Cookies for them! They’ve got oats, ground flaxseeds, cranberries, sunflower seeds, chocolate – everything you love about granola but portable! They’re so soft and delicious! And the salty sunflower seeds were perfect with all the sweet components! 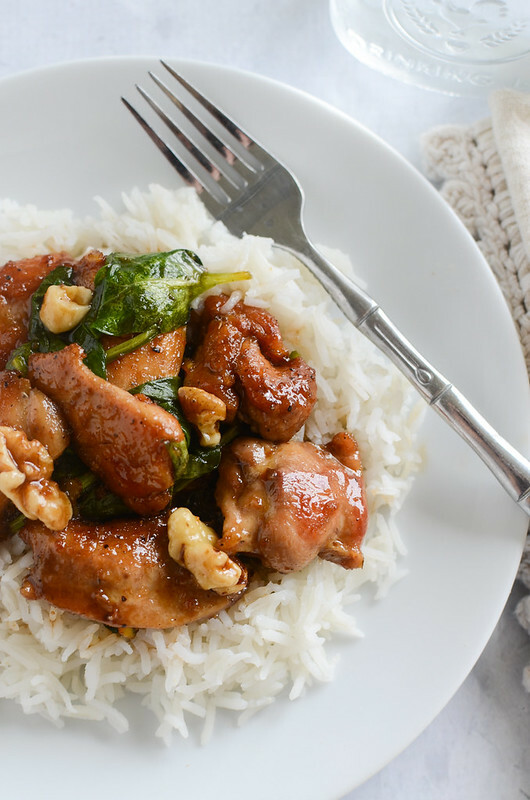 Orange-Balsamic Chicken Thighs are ready in under 30 minutes and will quickly become a family favorite! This is the first day in weeks I don’t feel like total garbage so I am so excited for the day. Also, can we talk about how I’ve been sick more in the last year than I have been my entire life? Now let me tell you all about my new favorite chicken recipe. I made this twice last week. Which is unheard of for me. I rarely repeat recipes in a month, but especially never in a week! I made it the first time and decided not to take photos and then kicked myself when everyone loved it and there wasn’t a single piece of chicken leftovers. So two days later, we had it again. And no one complained! It starts with chicken thighs which are my favorite. They’re so much tastier than the breasts and usually a lot cheaper. Once the thighs are cooked, you make a yummy sauce out of orange marmalade, balsamic vinegar, and sage. And then wilt some spinach in the same pan and top everything with chopped walnuts. 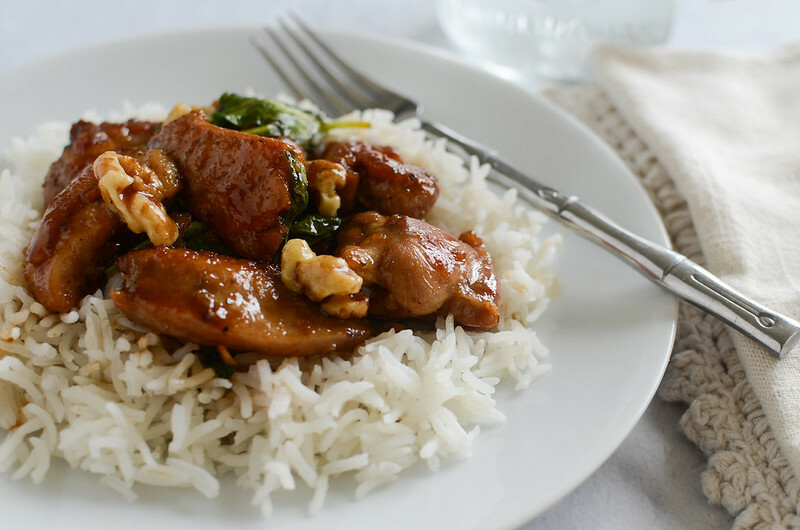 Serve over rice for a 30 minute meal that I guarantee the whole family will love! Weekly Family Menu Plan – featuring 5 weeknight dinner recipes, a weekend breakfast, and a delicious dessert! I hope you are having a great one! 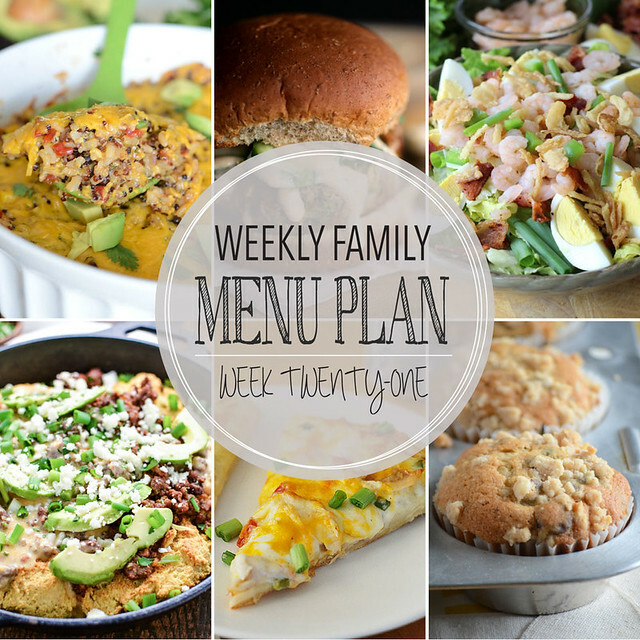 This week’s family menu plan has so many delicious recipes! Meatless Monday, a healthy burger, the prettiest salad, a twist on biscuits and gravy, and pizza Friday! Plus muffins for the weekend breakfast and the most scrumptious looking brownies for dessert! I feel like now that the holidays are behind us, I’m in full on spring mode. Which is ridiculous because I’m sure we still have several months days of cold ahead of us here in central Texas. I put up all my winter candles and brought out my hoard of watermelon lemonade – they just smell like summer! I am buying watery strawberries at the grocery store and pretending they don’t taste awful. 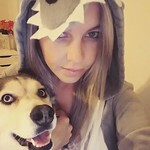 I’m even getting aggravated when I have to go back into the house for a hoodie. For whatever reason, citrus-y baked goods just feel like spring to me so, of course, I’ve got a mile long list of cakes, bars, and cookies that I want to make RIGHT NOW. I’m obsessed with all things grapefruit, all the time. Sometimes I buy those ginormous tubs of precut grapefruit and I kill it within 24 hours. It’s a problem. 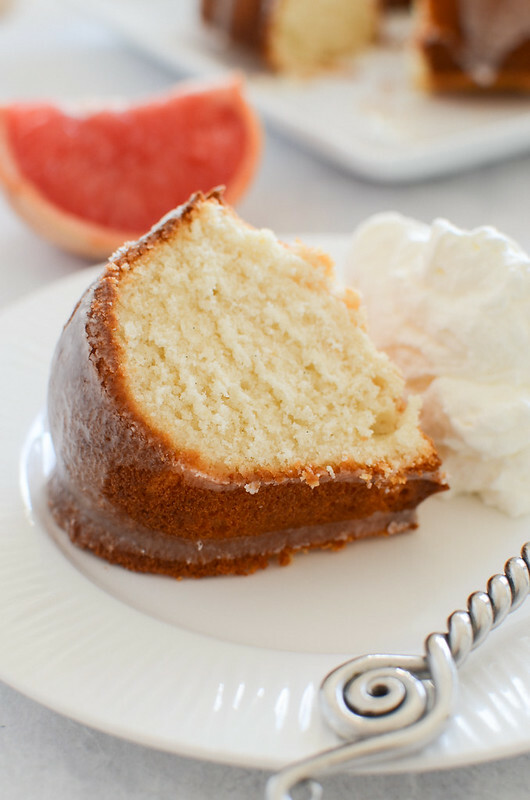 I got the idea of grapefruit pound cake stuck in my head weeks ago and finally had to go for it. Paired with some freshly whipped cream… perfection. 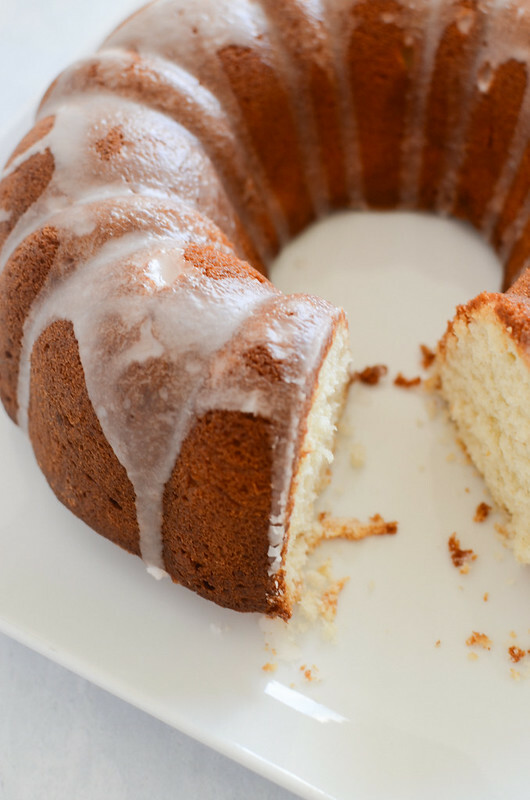 It’d be great for potlucks or parties because who doesn’t love pound cake? First recipe of 2016! And it’s a good one! I made this in anticipation of it being cold this week. So that I could talk about how warm and comforting it is but guys, it’s HOT in Texas again. It was so cold that it actually kind of snowed (like 5 snowflakes) days ago and now I’ve got the a/c on again. I can’t with you, Texas. Anyway, how was new years? Mine was a mess. You wouldn’t believe me if I told you about it. But I have been sworn to secrecy so we’re not going to talk about it. 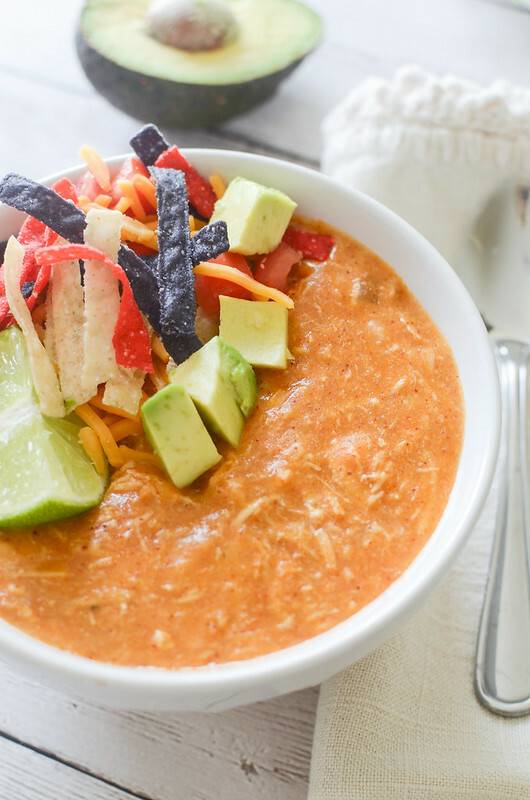 If it’s cold where you are, you should definitely give this Cheesy Chicken Enchilada Soup a try. 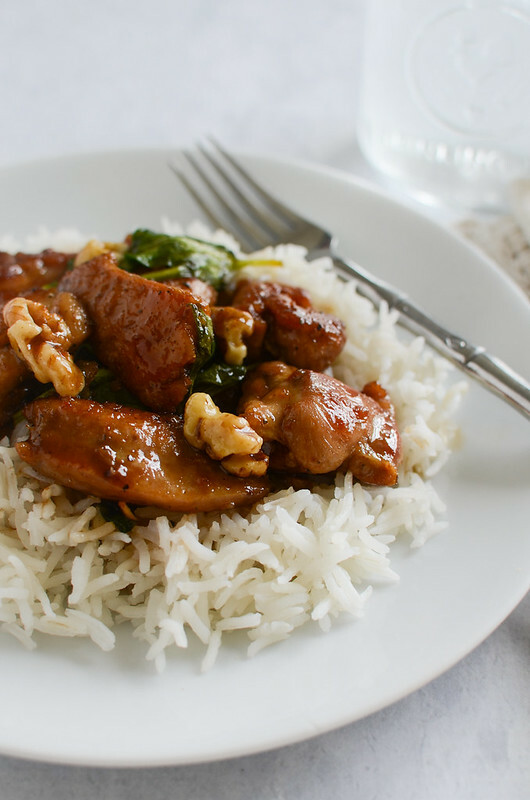 It’s really easy, takes almost no time to prepare and it is seriously delicious. I found myself dipping tortilla chips into the pot each time I walked past because I just couldn’t resist it. The toppings are a must. 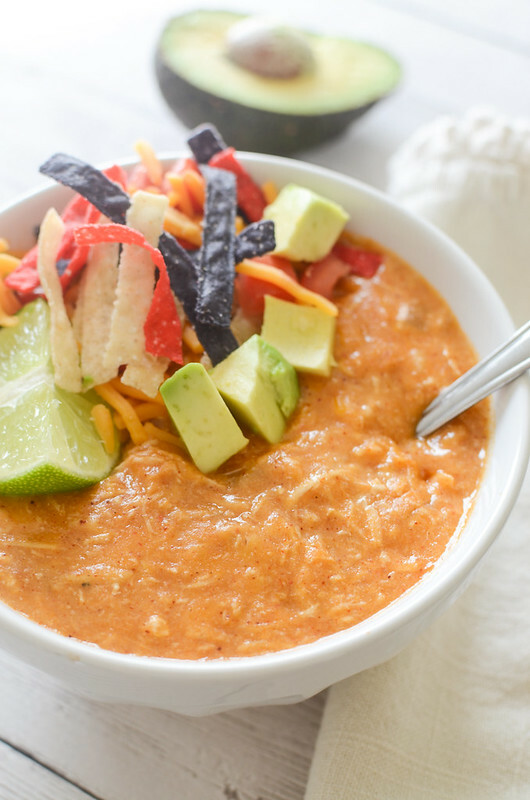 The best thing about soups like this is all the colorful toppings. Lime, avocado, cheese, tortilla strips! Pile them high – you’ll thank me!